I wrote about reading J.D. Vance's Hillbilly Elegy last year and today comes news that Netflix and Ron Howard's Imagine Entertainment are going forward with the film version. No casting news yet, but Howard will be directing and the script will be written by Oscar nominee Vanessa Taylor (The Shape of Water). 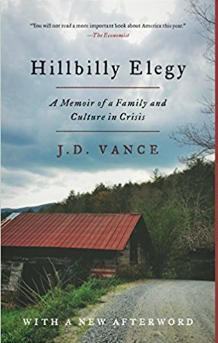 Needless to say, it will be interesting to see how Hollywood treats Vance's autobiography of growing up poverty-stricken in the Rust Belt, and how he fought his way out, especially in the current political climate.